[ #UnrealEngine #VR ]Today at Oculus Connect 2 in Hollywood, Epic Games Founder and CEO Tim Sweeney revealed Bullet Train, a new VR experience for the Oculus Rift, during Oculus CEO Brendan Iribe's keynote. Sweeney also confirmed that since Epic made Unreal Engine 4 available for free earlier this year at GDC, a million new developers have chosen Unreal, and many of these individuals and teams are creating amazing VR experiences. In order to explore and demonstrate the possibilities of this new medium, we've built a series of leading-edge demos over the past 18 months. Couch Knights showed the capabilities of the DK2, and then Showdown took advantage of CB1’s head tracking to immerse the viewer in a slow-motion action movie scene,” Sweeney continues. “And now, it's time for something new. Using the Oculus Touch controller for locomotion, we've built a world-scale VR gunfight experience with gameplay that weaves in and out of bullet time. Presenting: Bullet Train. Bullet Train is the latest VR experience from Epic Games. 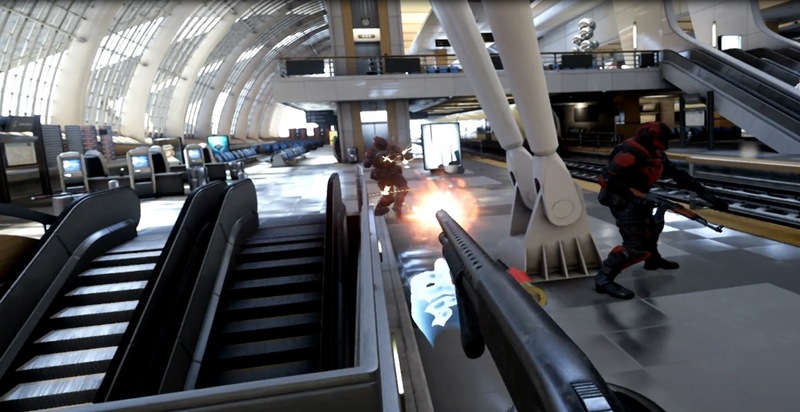 Staying true to form, Epic puts you in the middle of the action: Use motion controls in the role of an agent undergoing an infiltration simulation set inside a modern train station. Master the art of teleportation, time manipulation, and close-quarters combat to blast through resistance forces. Thanks to Unreal Engine technology and the Oculus Touch motion controllers, you can physically interact with an array of weapons, from guns to grenades to missiles, and even feel them through haptic feedback.